The Bloomberg Honolulu Star-Bulletin Index is a price-weighted index designed to measure the performance of Hawaii-based companies. The index was developed with a base value of 100 as of December 31, 1999. 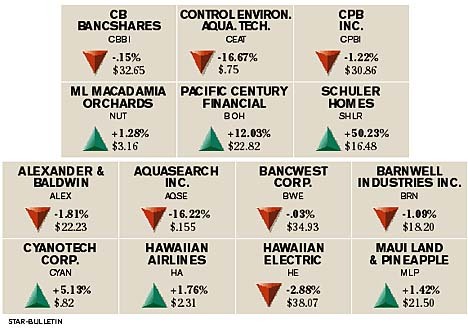 A chart of the index which shows the weekly performance of its members is published weekly in the Honolulu Star-Bulletin. 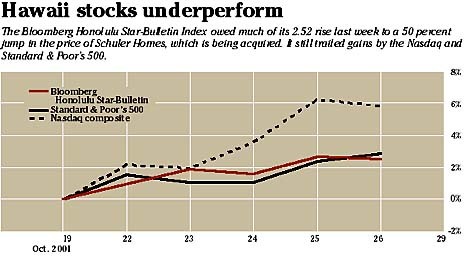 Schuler Homes Inc. ran away this week to lead the Bloomberg Honolulu Star-Bulletin Index of local stocks. Schuler's stock jumped 50.23 percent to $16.48 on news that it will be acquired by Texas-based D.R. Horton in a deal valued at about $1.2 billion. The move will make the combined company the nation's second-largest homebuilder. Pacific Century Financial Corp., parent of Bank of Hawaii, came in second with a 12.03 percent gain as earnings met Wall Street expectations and it announced a $200 million stock buyback program. Cyanotech Corp. gained 5.03 percent though its third-quarter earnings showed its losses are widening. Ceatech brought up the rear, with its shares dropping 16.67 percent to 75 cents. Big Island company Aquasearch lost 16.62 percent to 15.5 cents and Hawaiian Electric Industries dropped 2.88 percent to $38.07.